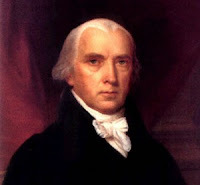 There was no doubt that it wasn’t James Madison in my living room so I had to assume it was C.W. Why he chose this particular form would become obvious soon enough. With his powdered wig slightly askew, he was sitting at my desk thumbing my pocket edition of the U.S. Constitution and mumbling to himself. “What’s cookin’ Satch?” I said. “I thought you wanted it that way,” I said. Why not play along? “That there no laws against this, as hard as we worked to produce such enlightenment?” He waved the Constitution at me. “Levity is not appropriate when discussing this,” he said and he flourished the Constitution again. He straightened his wig, gave me a deliciously wicked wink, and began to lift himself off the floor with the handle of a broom that he had laid nearby.